3 Ways Animal Communication Increases Your Happiness - and your animal’s! 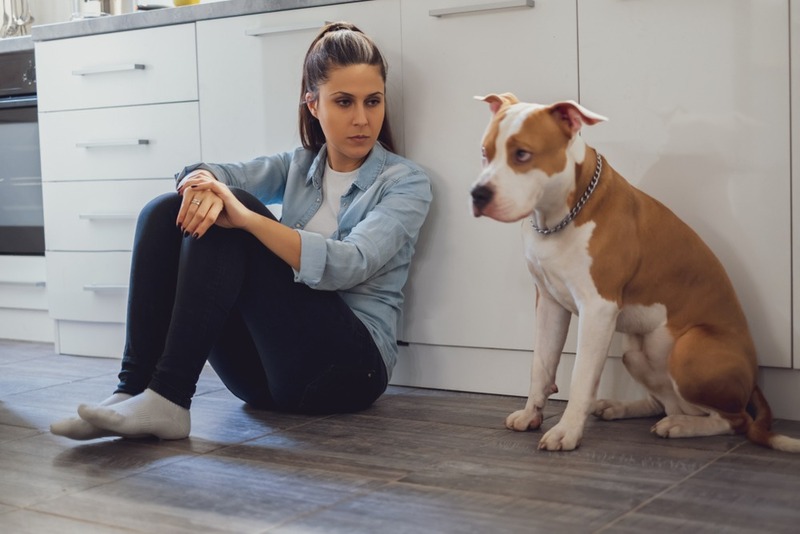 Lethargic animals, animals freaked out about going to the vets or taking a car ride, those who don’t listen when we try to keep them safe by teaching behaviors or setting limits – these situations are not the recipe for happy pet people. I’m sure you could share a few more situations that fall into this category. We didn’t bring an animal into our lives to be worried, frustrated or sad, but it happens. Sometimes communicating directly with our animal brings a perspective we wouldn’t have gotten any other way. And that information allows for a shift that makes us – and our animal – happier! That’s how animal communication increases happiness! Sometimes I am amazed when we find out what’s going on behind an animal’s behavior. We think we know the problem, but it can turn out to be different. Animal communication increases happiness when we figure out what’s really going on. Jenn’s dog Harley was acting sick and lethargic, and we were sure it was physical. She had some physical issues but addressing them made no difference in her behavior. In communicating with her, we realized her emotions were getting in the way of her happiness. She wanted more time outside, but she worried her people would think she didn’t love them if she wasn’t with them all the time. Once we knew this, we did an Emotional Freedom Technique (EFT/tapping) session to release her emotions. And Jenn told her (through me) they’d be glad to give her more outside time; they knew she loved them no matter what. Once the change was made, Harley perked up and became the dog Jenn always knew she could be! 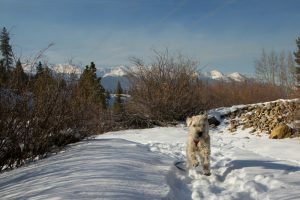 Lynn takes her dogs to a wonderful cabin in the Colorado woods where they can run free. Her older dogs, Jasper and Emmy, were great about staying close and coming back when called. Her younger dog, Chef, however, took off at times and didn’t come back when called. Lynn was in my UConnect class learning to communicate with her dogs. So she took this opportunity to tell Chef to stay where she could see him. But it wasn’t working. She connected again to find out why and heard him say, “I don’t know what you mean.” I suggested she tell Chef, “Stay close enough so you can see ME (Lynn)!” It’s been working. Lynn feels comfortable letting Chef enjoy his off-leash time and Chef is happy knowing Lynn is comfortable with him being in the woods now. Susan has a great weekend home but couldn’t bring her cat Bunker because he spent the whole drive crying about the car and the carrier. We’re talking a couple of hours – it was painful. She asked me if Bunker wanted to go to “the rivah” as they would say. He told me. “Yes!”, but they didn’t take him. 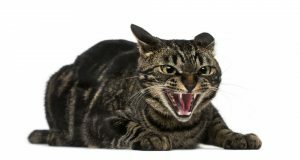 Susan told me Bunker treated his cat sitter badly that weekend, hissing and scratching. I checked in and found out he was angry that he was left behind. Deb’s dog, Sadie needed CCL knee surgery so she could continue to walk and run easily. The recovery was going to be tough – 8 weeks is a long time to not run, and 2 weeks of doing nothing when she was used to running twice a day was going to be a huge challenge. The first visit to the surgeon’s office, Deb could hardly drag Sadie into the building. Sadie was very anxious. Deb asked me to explain to Sadie what she was going to experience, how it was going to help her run again, and that it would take time before she could run again – she’d have to be patient. Deb reported that when she took Sadie to the vet the second time for surgery, Sadie didn’t hesitate to go into the building. She went right to the staff when it was time for them to part. The next 8 weeks went as best as could be expected. 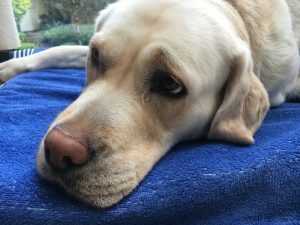 Sadie did exactly what she needed to do in her physical therapy and made a full recovery. They are back at the dog park playing with friends, running, jumping and living life joyfully. When Deb joined, my UConnect class, she was able to communicate with Sadie herself about a second knee surgery. Sadie cooperated with Deb and the veterinary team and was patient with the healing just like she did after my connecting with her the first time. Need to find out what’s going on with your animal? Want to learn how to communicate with your animal?